Rumours that Google might be developing a new type of chat/messenger service have been endorsed by some leaked screenshots that appeared yesterday. The new service, named Google Babel, appears to be more of a rebranding than an entirely new invention. It will supposedly redesign the current GMail Chat tool into a more SMS-like messaging format. The natural extension being that Google can launch it onto the Google Play store as an app to compete with the likes of Whatsapp and MessageMe. 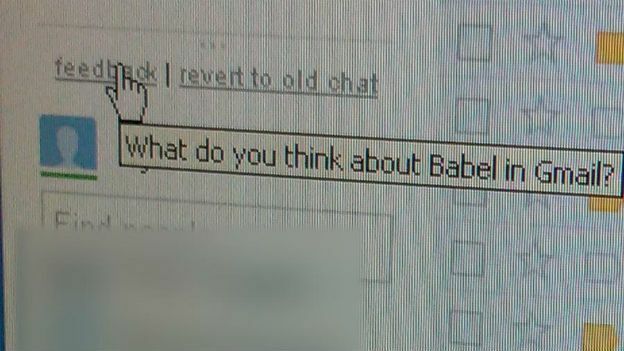 One of the screenshots obtained by TechRadar from an anonymous source claiming to be a Google employee show the "Babel" name in a hover-over message for the feedback hyperlink. The images appear to be genuine and tie-in to the mutterings about Babel that have surfaced over the last week or so. According to TechRadar, the service will come with several new emoticons and the ability to jump quickly into a Google+ hangout if the need arises. It's some timely evidence, considering the rumours that Google is planning an acquisition of Whatsapp in order to make a move into the mobile instant-messaging game. The full reveal of Google Babel could be timed for Google I/O in May, but predictably there's no official word on what to expect. We'll keep an eye out and update you as soon as we know more.